In the early 20th century Ebenezer Howard proposed the Garden City, a community designed in such a way as to strike balance between the natural environment and the built environment. There would be space, there would be order, and there would be greenery. His premise was a utopian city, a new take on urbanism that would remedy the faults of existing cities once and for all. Thirty years later Le Corbusier pursued a similar urban theory based on replacing the chaos of haphazard urban development with simple, rational order. This time the city would also be expressive of modernity, and therefore built around the automobile. He called his plan The Radiant City. Neither was built as designed, but the concept of a utopian city inspired countless planners and architects whose derivative visions materialized in places as far away as Brasilia and Canberra. South Korea’s Paju Book City, which was begun in 1999, is one such development and is an example of the latest incarnation of utopian urbanity. The city is located on the northern outskirts of Seoul and was designed to house all of the major publishing companies in Korea. Its grid of streets is filled with exquisite but unrelated object buildings designed by the most talented young Asian architects. One cannot walk a few blocks in less than an hour because each publishing office commands attention to its structure, skin system, circulation, materiality, or some combination thereof. 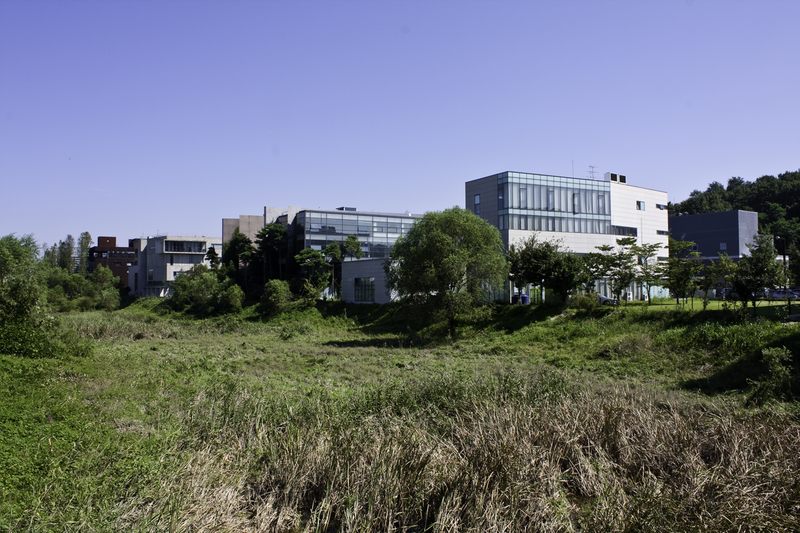 Brochures describe the development as a wetland-city, where great care was taken to preserve natural features such as streams and ponds between each building. Traffic signals are synchronized, the streets are clean, there are no commonplace buildings, there is ample parking, and ostensibly no crime or transients. Yet the city’s flaw seems to be that it is that it is too perfect. Paju Book City is so polished and pristine with its designer architecture on every block that avoiding desensitization is difficult. With no commonplace buildings to act as filler, standout architecture no longer stands out and thus forfeits its power. Moreover, because the city is carefully planned to avoid unpredictable development, there exist no moments when contrast or surprise capture our attention. Moments like walking down New York’s Wall Street and suddenly encountering Trinity Church in a canyon of otherwise bland highrises, or settling into the repetitive fabric of Paris and then being jolted to life by the façade of the Pompidou Center. These experiences of organic juxtaposition are the essence of city life, and prove that the exceptional requires the ordinary to flank its side. Fifty years ago a small group of urbanists led by Jane Jacobs leveled these and multiple books worth of other critiques against the idea of utopian cities comprised of single use object buildings. These assessments slowly gained traction over the years, and citywide schemes of preconceived urbanity seem to have mostly fallen out of vogue. Paju Book City has become a tremendous showcase of innovative architecture and seems to be appreciated by the publishing offices located within it, but its urban concept was anachronistic before the project even broke ground, and for my part I would rather see its tremendous architecture spread around the urban fabric of Seoul amongst ordinary buildings where it would truly stand out.